Cindy Cohn is the executive director of the Electronic Frontier Foundation, the international non-profit digital rights organization. From 2000 to 2015 Cohn served as Legal Director and General Counsel for EFF, but her involvement with the organization goes back to 1993. On February 7th, Cohn announced the death of EFF Founder John Perry Barlow. Barlow was a multi-talented man and a colorful figure. He was a poet, an essayist, a cattle rancher and a former lyricist for the Grateful Dead. Ms. Cohn was gracious enough to let me interview her about her unique perspective working with cyberlibertarian Barlow for the past 27 years. 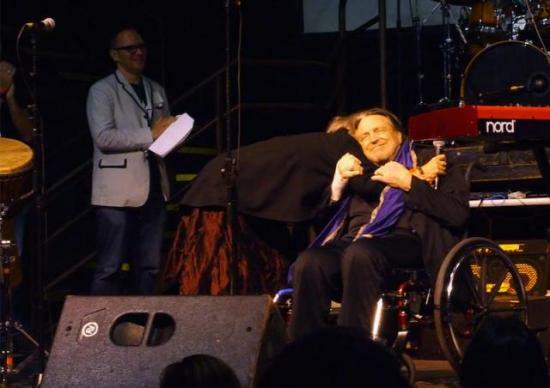 Cindy Cohn hugs John Perry Barlow at EFF's 25th anniversary event. SL: Cindy, thank you for agreeing to this interview under these sad circumstances. You became involved with the EFF in 1993, and you were discussing important issues with Barlow since the EFF's inception in 1990. What were the pressing issues of that time? CC: Freeing encryption from government control, establishing that the Internet was a place of free speech (CDA decided at the Supreme Court) and limiting the obligation of Internet providers to provide governmental access (CALEA). SL: In recent times, what forces did Barlow see as the greatest threat to Internet freedom? CC: Recently he was focused on protecting whistleblowers and ensuring that people had a "right to know". He was especially committed to the work of the Freedom of the Press Foundation that he helped found. SL: What was Barlow's biggest win for Internet freedom? CC: It is no exaggeration to say that major parts of the Internet we all know and love today exist and thrive because of Barlow's vision and leadership. He always saw the Internet as a fundamental place of freedom, where voices long silenced can find an audience and people can connect with others regardless of physical distance. "That idea is under threat now but the fact that we all feel it's something we stand to "lose" as opposed to something we never had is because of Barlow. SL: How did Barlow influence your career and your life? CC: Barlow is the person who first taught me that our rights are not given; we have to take them. That has been my guiding philosophy. SL: What was Barlow's greatest gift as a founder and leader? CC: I think his greatest gift was his optimistic belief and hope in people. He had a great intellect and an incredible gift with words, of course. But his belief that if we wanted to we could make the world a better place and use technology to do it was, to me, his lasting gift. SL: Barlow was a prolific writer. Which of his writings impacted you most deeply? CC: Selling Wine without Bottles. Crime and Puzzlement. SL: Other than net neutrality, what are major threats to freedom and human rights that aren't on the public's radar that should be? CC: The normalization of mass surveillance. SESTA. SL: Any final thoughts you'd like to add? CC: I feel like now we're at a time when it's fashionable to focus on the problems that technology is bringing to society. I think that many people view this as an inherent problems with technology and also that we are powerless against it. Barlow definitely was aware that technology could make society worse but strongly, consistently and joyfully always reminded us that we were in control. He said: "I knew it's also true that a good way to invent the future is to predict it. So I predicted Utopia, hoping to give Liberty a running start before the laws of Moore and Metcalfe delivered up what Ed Snowden now correctly calls 'turn-key totalitarianism." SL: Thank you for your time and engagement. Sol Lederman is a technical people-oriented professional with more than 30 years of broad experience in system administration, software design and development, technical support, training, documentation, troubleshooting and customer management. Sol currently divides his time providing IT, consulting and writing services. Learn more at http://SolLederman.com.